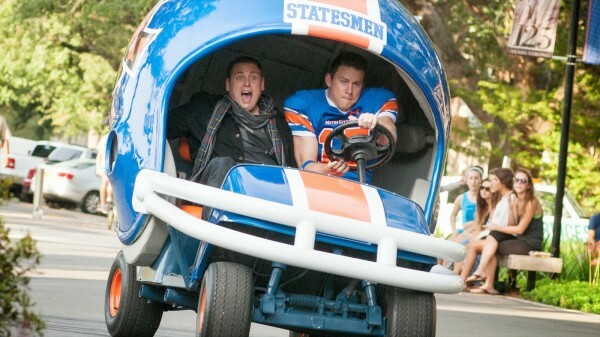 “22 Jump Street” is on par with its predecessor (Read the “21 Jump Street” review). What it loses in freshness it makes up for with sheer wit. The first movie was a genre sendup nothing short of genius, and Michael Bacall and Jonah Hill, who whipped up the first film’s story, have gone all in on the sequel: no, not bigger and crazier, but more tongue-in-cheek and self-aware. If directors Christopher Miller and Phil Lord (“21 Jump Street,” “The LEGO Movie,” “Cloudy with a Chance of Meatballs”) hadn’t earned carte blanche already, making one of the only good comedy sequels of all time will. This feat is so hard to achieve, it arguably warrants “22 Jump Street” a perfect rating. But the reality is that the film is more of the same, it just knows it, and the filmmakers package it exceptionally well. In fact, in the first self-aware scene, Schmidt (Hill) and Jenko (Channing Tatum) are debriefed by Dep. Chief Hardy (Nick Offerman) — in and of itself a replica of a scene in the first film — who tells them how their first mission was a big success, and no one expected it, so now the department is throwing more money at them in hopes of a bigger success, and he encourages them to do “the exact same thing.” This becomes a motif of the movie, so it knowingly replicates itself. By and large this works (both actually and in the meta sense) though there are slow parts in the beginning. Essentially, as promised at the end of the first movie, Schmidt and Jenko have to go undercover at a college to find yet another new synthetic drug. They find it a little more challenging to accomplish than last time, but ultimately they both connect with students who are connected to their only lead: Schmidt falls for an art major (Amber Stevens) while Jenko meets his twin (personality-wise) in Wyatt Russell’s character, a quarterback and frat boy. Of course with any comedy sequel, doing “the exact same thing” puts the movie at risk for getting stale. “The Hangover: Part 2” is a prime example of trotting out the same exact formula and failing miserably. “22 Jump Street” counters this problem by laughing at itself a lot and going over the top with the repetitive, familiar scenes, such as whenever Schmidt and Jenko fight with each other and go off on their own. It also stays fresh just by the extent to which it copies stuff from the first movie and does so while winking at the camera. In order for this to really work, however, the foundation still has to be solid and Hill and Tatum provide that effortlessly. Their chemistry maintains interest in the story even though the story has no interest in taking itself seriously. Tatum was a secret weapon the first time around, as no one had seen him do comedy like this, but he still pulls off the meat-headed pretty boy man- child while Hill does his improvisation thing and proves why he’s the class of the Judd Apatow prodigies. The supporting cast doesn’t add much (Ice Cube is what you’d expect) though Jillian Bell’s dry deadpan evokes some Kristen Wiig before she became a star. So why can’t this type of comedy sequel be replicated ever again? Not every would-be comedy franchise can just make fun of itself in this meta way and poke fun at sequels in general. And the truth is that doing so was the difference-maker. Without an action scene, for example, in which the main characters are trying to outrun drug dealers in a football helmet golf cart and avoiding hitting stuff because too much wreckage will “cost the department too much money,” it’s just a dumb chase scene. “22 Jump Street” would’ve surprised and impressed very few people without these twists. And now that the meta card has been played, it’s hard to envision a third “Jump Street” as good as the first two. You can’t just play another and surprise anyone. Perhaps that’s why we get a highly amusing credits sequence at the end. How nice, however, to tell that a sequel really tried to be better and conveyed that to the audience. Rather than just throw something together to take advantage of the comedy sequel cash cow, Bacall, Hill, Lord, Miller and the other screenwriters really put some intelligence into making “22 Jump Street” and the genre is better for it.